I want to play Breath of the wild on my PC, but I get poor fps (around 15). I have an 8 cores AMD 8320 CPU which works at 3.5 stock GHz (it automatically bumps to 3.7 I believe when needed), 8GB RAM at 800MHz (plus 8GB of virtual memory as it was adviced somewhere to have for CEMU) and an R9 280X graphics card. I think I understand that CEMU works more on 1 core, so my problem might be solved if I can overclock my CPU by boosting the FSB ratio. I tried, set it so the CPU went to 4.5GHz, but it failed, I tried several times until it worked for a minute before getting a BSOD at 230MHz. Now I set it back to normal, but I'd like to understand why people have it working on their end. I've seen discussions and videos about people who tweaked it to 300MHz (x15 as for the multiplier, which gives also 4.5GHz) and it works. I'm pretty sure it doesn't have to deal with the temperature, as when I arrive back in the BIOS after the crashes, it wasn't high (even though a few seconds had passed, I don't think it would have gone down by 40Â°C in 10s). Btw, the reason I want to play it on my PC is because I finished the game once on my brother's WiiU, which he got back, wanted to buy a Switch to play it more, but saves aren't transferable from WiiU to Switch, so if it means starting over, I'd rather try emulation. To be stable, your CPU need to to be break-in (sorry, i'm not sure it is the right word) : you'll have to stress it each time you'll found a stable frequency. - Begin with tweaking only the multiplier (to avoid issues with HTLink, NorthBridge and DDRAM frequencies) : it must give you an idea of what frequency you might reach. Take care of these frequencies too ! I have 1600 DDR3 modules running close to 2000 (FSB@240MHz i beleive, so increased by 20%). Manage to do this by modifying their timings. For the cooler : FX 6300 is 95W TDP and i put an Artic Freezer A32 made for 300W TDP. As my CPU temperature does not exceed 57°C on heavy load (and max is 71.1°C for the FX-6300), i also get a silent rig ! Always check stability and monitor your temperatures (set a threshold to 61°C on CPU package temp in your case). Also, becarefull of your room's ambiant temperature (mostly in summer). 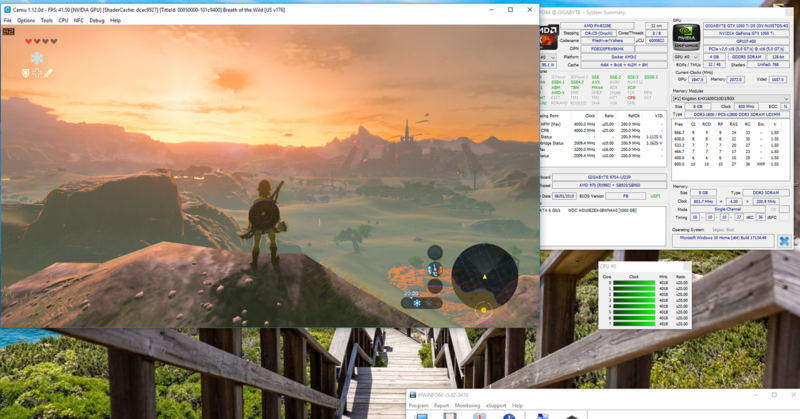 Having a AMD CPU+GPU is known to struggle with CEMU. I switched from a HD7500 to an used GTX950 (40€) last year. Last edited by Laf111; 23.05.2018 at 13:43. I have my FX 8320-E at 4.00 ghz with vcore 1.275 undervolt and a GTX 1050ti. Zelda runs with minimum of 25 fps in cities and out at 40 fps. With the AVG about 30-33 fps. 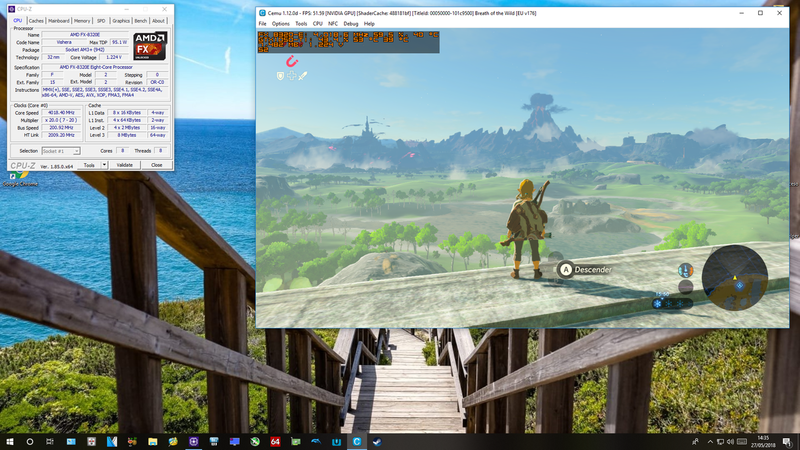 CEMU works horrible with AMD gpus. You do not need much overclock. You need an Nvidia card. 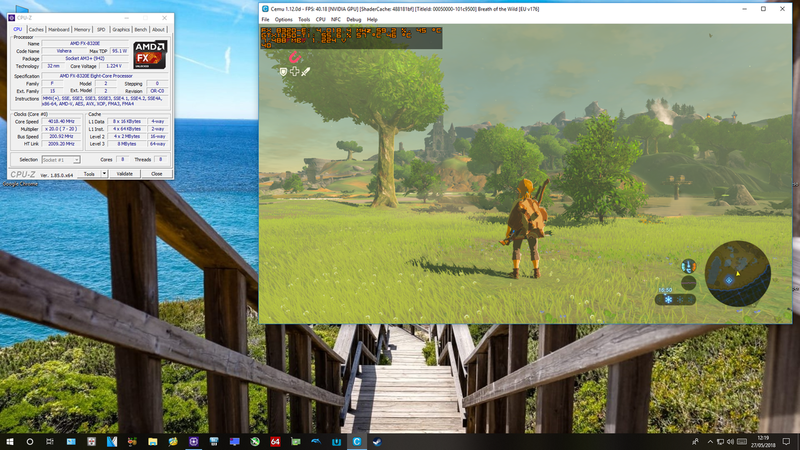 With SSD , 8gb and FX 4,00 ghz or 4,2 ghz + graphic pack FPS ++ ZELDA work very well. Last edited by jmrd; 24.05.2018 at 12:42. I also noticed a FPS boost when i switched to Nvidia. I think overclock is still recommended, even since multi-core modes (CEMU >= 1.11.3). Multi-core mode does not significantly increase the max FPS but give a better FPS average (less drop). FPS overclock will give you better perfomance on your DRAM use. @jmrd : I have the same chips of you on my FX-6300. You don't give the resolution but it is mostly related to your GPU performance. Last edited by Laf111; 25.05.2018 at 13:17. Thank you, though having no answers and finding a great deal on a used Switch, I bought it and play the game on it... I couldn't transfer my saves AND couldn't use the expansion pass on it, cause it's for Wii U, in addition... Thanks, Nintendo. My GPU usage was at 22%, so I'd rather think it was CPU wise that my problem laid. I'll keep this page in mind if I ever need to over lock it in the future. I do not need much overclock, just know how to configure everything very well. I'm going to put a video with parameters in cities it works well only at 4.00 ghz. You will see this night a new video in cities. Outside much better rates. This night I post a new video with all the settings and only 4,00 ghz in FX. Fx 8320-e 4,00 1.27 vcore. 12 gb 1600 dual channel kingston hyper. This night I post a new video with all the settings. Of course with mi Fx 4,2 or 4,4 ghz best fps...but i need for the moment 4,00 ghz. With 25 fps perfect experience, but i have more fps of AVG with my pc. Last edited by jmrd; 25.05.2018 at 18:18. One moment...my PC in this video. Last edited by jmrd; 27.05.2018 at 11:28. Last edited by Laf111; 27.05.2018 at 13:07. Yes but this game work perfect with 25 fps constants. It's funny because I do not feel a curve of fps. 25-30-45-50 fps always runs well, linear, with constant speed. FPS ++ is very well adjusted. On the wall I also get 52 fps at only 4.00 ghz. The perception of the graphic pack is false. From the FX, I5, I7 or RYZEN they really go at 30 fps. They hit the screen with 60,80,120 fps and it is false. The game is programmed for 30 fps. Last edited by jmrd; 27.05.2018 at 19:45.